One of the main driving forces behind the Perry's Full Circle style is my son, Jayson. Since age 12, Jayson has been beside me on the mat, training for any and all the competitions in which I competed. He was subjected to training with only the best - athletes that trained for international, world, and Olympic caliber competitions. He was always willing and ready to learn more, even if it meant that he had to take more flying lessons until I got my throws down efficiently. With all his airtime, he has to be the world's best uki! 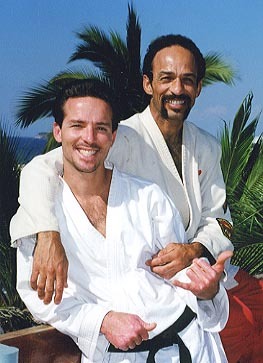 Sensei Jayson Perry and Grandmaster Jody Perry after giving a series of seminars in Mazatlan, Mexico. As Perry's Full Circle entered different martial arts arenas testing the newly created mixed martial arts system against other styles, Jayson was always on the front lines ready, willing and able to show everyone that PFC was for real. In following my footsteps, Jayson has ventured into other martial arts outside the many PFC techniques already being taught. He is always seeking more experiences and knowledge of the arts, and I believe his day will come as a leader in the martial arts world. I feel I am blessed to have such a great relationship with my son, and I am fortunate to have such a loyal and dedicated student.